India’s largest crowdfunding site. Over $77.9 Million raised. This is a supporting campaign. Contributions made to this campaign will go towards the main campaign. This campaign has stopped and can no longer accept donations. 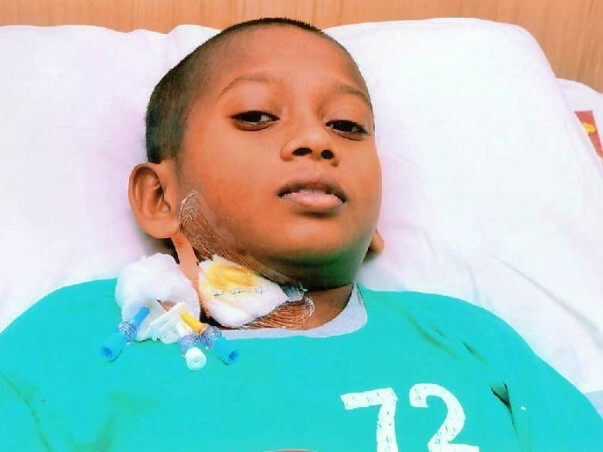 12-year-old Hemanth, son of Venkat and Shanti, has been suffering from a type of blood cancer called Anaplastic Lymphoma which causes the growth of cancerous tumors in the body. 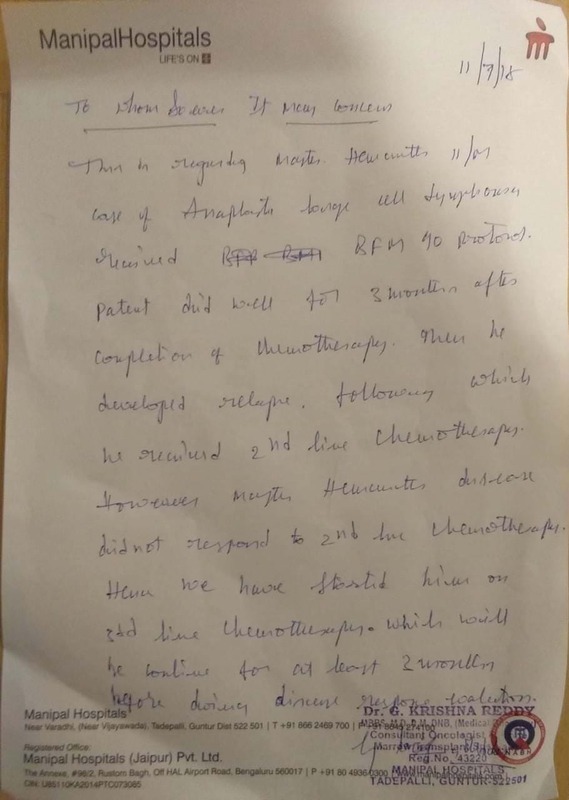 The only treatment for Hemanth now is chemotherapy which is amounting to around 8 lakh Rs. Unfortunately, Venkat does not have sufficient funds to afford his son's treatment and needs our help. Your contribution can give Hemanth the treatment he deserves. Donated to this campaign via Paytm or bank transfer? Click here if you have not received an email confirmation from Milaap. Thank you for your tremendous love and support. This means a lot to us. With inexplicable grief, we're having to inform you all that Hemanth passed away. He underwent chemotherapy and successfully completed the treatment. However, his health started worsening one month post the treatment and the disease relapsed. He then received salvage chemotherapy but he stopped responding to the treatment later which further complicated his condition. Even after giving the best of medical care possible, we couldn't save him. 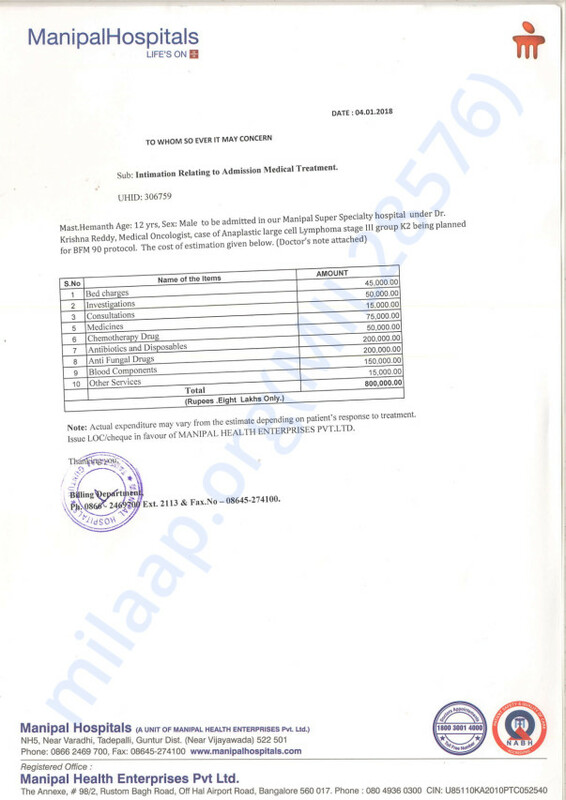 A majority of the funds raised from this campaign have been utilised for his treatment but a small amount is pending which we are mapping to Pavan Kumar's campaign - https://milaap.org/fundraisers/help-pavan-kumar. Pavan is a 19-year-old boy suffering from Acute Lymphoblastic Leukemia and requires a bone marrow transplant. Thank you everyone for being so supportive. Thank you for the wonderful support that you have shown towards Hemanth. I have some news to share with you today. Master Hemanth had completed all the initially prescribed chemotherapy cycles. His response to the treatment was positive and he was showing good signs of recovery. He then relapsed following which he was administered the second line of chemotherapy. 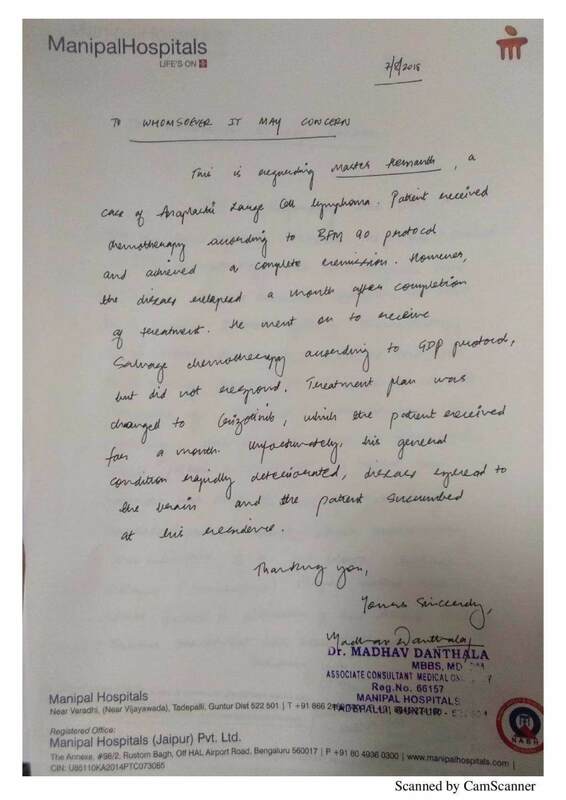 He did not show any response to the treatment and the third line of chemotherapy was started. This will be administered to him for the next three months. Based on his health and response to the treatment we will be able to suggested the future course of action. Do pray for his health and speedy recovery. Will keep you posted. Thank you for the wonderful support that you have shown towards my son Hemanth. I have some wonderful news to share with you today. My son has completed the chemotherapy cycles successfully. He has normal side effects like hair fall, nausea etc and the doctors suggest that he should be recovering from them soon. He had developed throat infection and was undergoing treatment for the same. He has been advised regular checkups and the doctors monitor his health closely and based on his health they suggest the next course of action. I would like to thank all of you for the wonderful support that you have shown towards him. Do pray for his health and speedy recovery. Will keep you posted. Content Disclaimer: The facts and opinions, expressed in this fundraiser page are those of the campaign organiser or users, and not Milaap. Donated to this campaign via Paytm? Click here if you can’t find your donation listed below. Questions? We will reply in 15 minutes! Milaap Social Ventures India Pvt. Ltd.
© 2010 - 2019 milaap.org. All rights reserved.